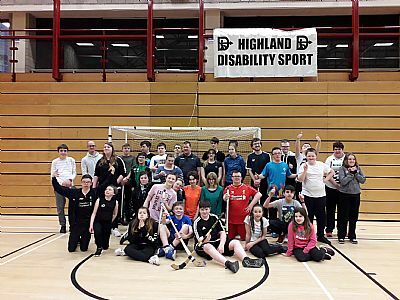 Highland Disability Sport hosted it's annual shinty taster day on Tuesday 26th March. The day proved extremely popular with the participants who had come from Beauly, Grantown, Inverness and Muir of Ord. Katie Drain, (Camanachd Association Regional Development Officer, North) took charge of the day, assisted by Neil Brindle. Huge thanks to them for yet another enjoyable shinty session for our athletes. 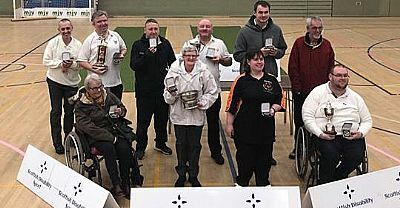 Huge congratulations to Evan MacKintosh for successfully retaining the National title for wheelchair bowlers at the recent Scottish Disability Sport Carpet Bowls Championships. Evan was the only representative from Highland at the championships, as the rest of the squad were unable to travel due to local weather conditions. Evan is pictured on the far right of the photo.